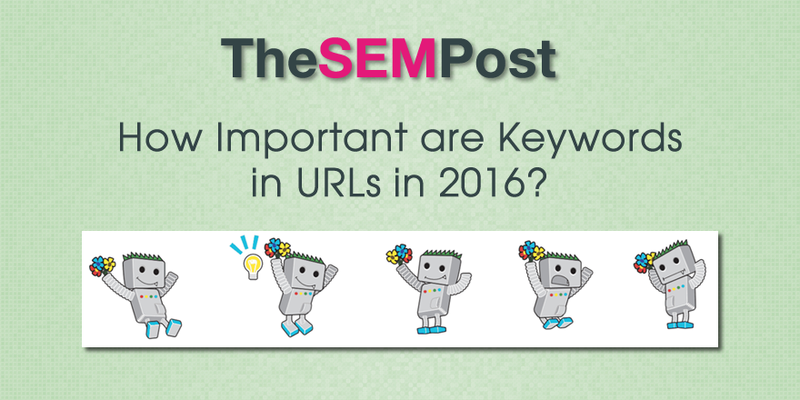 How Important are Keywords in URLs in 2016? You are here: Home / Google / How Important are Keywords in URLs in 2016? If you have been in the search industry for a long time, you will likely remember the days when having keywords in the URL was extremely important, and seeing page URLs like www.example.com/buy-keyword-keyword-keyword-online-now.html was pretty common. Obviously, much as changed with SEO since that was important 10-15 years ago. In yesterday’s hangout, someone asked how important keywords are in URLs nowadays. Not surpisingly, John Mueller, a Webmaster Trends Analyst at Google said that while it is a ranking factor, it is a pretty small one these days. I believe that’s a really small ranking factor, so it’s not something I’d really try to force. And it’s not something where I’d say it’s even worth your effort to kind of restructure a site just so you can include keywords in the URL. So if you are making new URLs, you would definitely want to include your most important keyword or two into the URL, but he doesn’t see much benefit in creating an entirely new URL structure just to take advantage of more keywords in the URLs. That said, I am sure that won’t stop people from doing just that! Here is the video from yesterday’s hangout where Mueller commented on the keywords in URLs issue. I accept the theory but in practice I still see exact match domains ranking highly simply because of the domain name. Just one example if I take one keyword phrase from a niche I am active in then most sites on page one are big hitters – Newspapers, respected industry sites, the big players in the industry. Sitting there at position 7 on page 1 is a site with few links, awful (and thin) content, few pages and limited on site SEO but the domain name is an exact match for the keyword phrase. This is not an isolated case. It may well change in the near future but today (unfortunately) exact match still seems to work. The only thing I would say about this is although it may not be a key ranking factor anymore, it sure is nice to have the keywords bolded in the SERP, especially now that the words in the no longer bold.